The Housing and Planning Bill 2015 aims to roll back any possibility of decent housing for all. Along with other recent ‘reforms’ – and after more than three decades of attack by both Conservative and Labour governments – the Bill seeks to drive a final nail into the coffin of social housing, while giving free rein to an increasingly unregulated, greedy and corrupt private rental sector. Poverty, evictions, homelessness, and insecurity will rise exponentially and the working class will be forced back into slum conditions. The right to decent, affordable and secure housing is one of the key issues facing the working class today. We need to fight for it. Cat Wiener reports. In 1942, the Beveridge Report set out the government’s vision for the creation of the modern welfare state. Amongst the five evil ‘giants’ it set out to slay was Squalor: the appalling conditions of inadequate, overcrowded, damp and unsafe housing that was the lot of the majority of the working class in Britain’s industrial cities. It would do that by building decent housing on a massive scale, introducing secure lifelong tenancies and capping rents within the private sector. All this will be a thing of the past if the current Housing Bill becomes law. Following the announcement in the Summer Budget of the extension of Right-to-Buy to Britain’s 1.3 million housing association tenants, the majority of the largest housing associations colluded with the government by entering into a ‘voluntary agreement’. Even housing associations opposed to the deal will be compelled to sell to any tenant wishing to take advantage of the generous discount (£103,000 in London, £79,000 elsewhere) on offer. The pilot scheme began with five housing associations at midnight on 26 November, immediately after the Chancellor’s Autumn Statement. In a double whammy, this discount will be funded by forcing councils to sell off their highest value properties. There must be a glint in the eye of estate agents like Savills, who published a report in 2015 designating inner-city council estates as ‘high-value, brownfield sites’, ripe for lucrative private development. Housing charity Shelter estimates that London’s richest borough, Kensington and Chelsea, will lose 97% of all its social housing under these provisions. Hammersmith and Fulham in west London and Camden in north London will lose around 50%. Other major cities would also feel the heat: Cambridge is expected to lose some 3,200 council homes (46%) and York 1,400 – about a fifth of its stock. For every nine council homes sold under the Right-to-Buy policy, only one new one has been built. Housing associations have to replace homes on a one-for-one basis – but they do not have to be, and clearly will not be, social or even ‘affordable’ (80% of market rent) units. Under the ‘voluntary agreement’, housing associations will now be free to build any type of housing they choose; the majority have made it clear that, following the 1% rent reduction in social rents announced in the Summer Budget (see FRFI 247), these will be homes for private sale, shared ownership or full market rents. 40% of homes bought under Right-to-Buy end up being let privately, at rents up to seven times the average social rent (Inside Housing, August 2015). What little ‘affordable’ housing has been built in London in the last few years has been largely as a result of section 106 planning conditions, which require developers to either provide affordable housing as part of their development or to pay local authorities to commission it elsewhere. This is being replaced by a requirement to build the Conservatives’ much-vaunted ‘starter’ homes for sale. This is a sop to the middle classes: so deep is the housing crisis in London and the southeast, that even comparatively well-heeled young people are struggling to get onto the housing ladder they once saw as their right. Shelter has pointed out that these discounted homes, offered mainly to those under 40, are completely out of the reach of people on an average wage in more than half the country. The promise of 400,000 such homes, extended in the Chancellor’s Autumn Statement, along with the promise of a further 135,000 shared ownership homes, will do nothing to address the housing crisis facing the working class. Patrick Collinson, writing in The Guardian on 25 November, says that ‘Combined with an easing up of planning rules, it adds up to a developers’ charter, with Taylor Wimpey, Barratt Developments and Persimmon among the fastest-rising shares on the London stock exchange on the day of the Chancellor’s speech.’ Meanwhile, new developments – such as those built on the Heygate Estate site in Southwark – will be freed from paying even lip-service to a requirement for ‘affordable’ housing. The Housing Bill requires social housing tenants earning more than £30,000 a year (£40,000 in London) to pay full market rents. This is vicious. As the housing campaigner Joe Halewood points out, a family outside London in which two adults both work 40 hours a week on £7.20 an hour (the national living wage due to come into effect next year) would have a combined income of £30,034. In London, a couple earning just over £40,000 pa would see a rent increase of £17,732 a year. In addition to forcing such households either into penury or out of their secure housing to face the vagaries of the private rented sector, this money will not be used to build more housing stock but will be returned to the Chancellor for ‘deficit’ reduction. Meanwhile, the lowering of the overall benefit cap will slash the maximum amount of benefits any household can claim to £23,000 in London and £20,000 elsewhere. In London and other cities with rocketing rents, it becomes effectively a cap on housing benefit. As we reported in FRFI 247, that means in most parts of London, a family with two children living on benefits will be able to afford to rent, at best, a single room. Many others will face eviction as, unable to meet the shortfall in rent, arrears build up. The cap is expected to hit 200,000 of the poorest households in the country. Where are they to go? In August, the right-wing Adam Smith Institute published on its blog a prize-winning student essay arguing that the UK housing market ‘is crying out for slums’. It caused a media furore, but the think tank stood by it. British capitalism in crisis is no longer willing to meet the costs of state welfare for the mass of the working class. Housing benefit alone is £1bn higher in 2015 than it was five years ago. 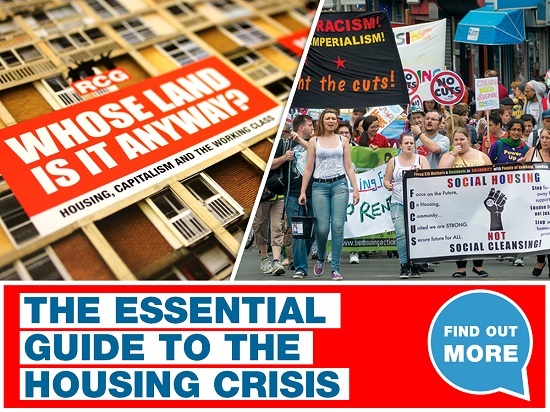 Nor – hellbent as it is on shrinking the public sector – will it tolerate social housing when there are profits to be made from forcing ever greater sections of the working class back into the deregulated Wild West of the private sector. In London, an average family spends half of household income on rent. In May, Citizens Advice published a report showing the extent of dangerous conditions, vermin, damp and cold in the private rented sector. Bullying, harassment, theft and negligence by private landlords are commonplace. Overcrowding in inner and outer London is rife, with the Labour-controlled east London borough of Newham by far the worst offender (25%), followed by Brent in North London (18%) (London’s Poverty Profile 2015). The most vulnerable, such as migrants or young people, unable to afford the administration and finders’ fees of grasping letting agents, are easy prey for unscrupulous landlords renting out garages, sheds, stairwells and even shelves. More than a quarter of Conservative MPs are landlords. It is therefore no surprise that the government has been pushing through an agenda of deregulation. Immediately after the May election, the new Housing Minister, Brandon Lewis (himself, of course, a landlord) moved to ban councils from enforcing borough-wide schemes to investigate and license private landlords. In October, Conservative MP Philip Davies (also a landlord), opposed an updating of a law requiring homes to be ‘fit for human habitation’. In 1873, Frederick Engels, writing of the German housing crisis of the time, pointed out that, under capitalism, this was inevitable.